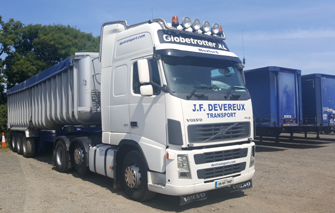 Our fleet at James F. Devereux & Sons haulage company in Wexford operates 24 hours a day to ensure that you, our customers, meet your commitments to your customers. James F. Devereux & Sons Transport are on the road 52 weeks of the year with collections and deliveries throughout Ireland and the U.K.
James F. Devereux & Sons Transport is an Irish transport company in Wexford specialising in national and international transport, both import and export. The fleet consists of Volvo trucks and trailers:- euroliners, curtainsiders, flatbeds, extendable flatbeds, step-frame low loaders, extendable step-frame low loaders, tankers and bulk tippers and skelly trailers. We provide a full range of services:- full loads delivered to and from the U.K. and within Ireland. We also provide warehousing & storage of customer-owned inventories until they are ready to be delivered. We specialise in a wide range of deliveries:- dry freight, tanks, timber frame houses, steel, sand, machinery, grain and potatoes. Some of our satisfied clients include:- DeLaval, Inish Pebble, Kilmore Potatoes, The Timber Frame Company, and a large number of other private companies. We also provide a range of specialist loading and unloading equipment:- truck mounted cranes, teleporters, forklifts, heavy duty forklifts, trailer mounted moffetts. We are members of the Irish Road Haulage Association.